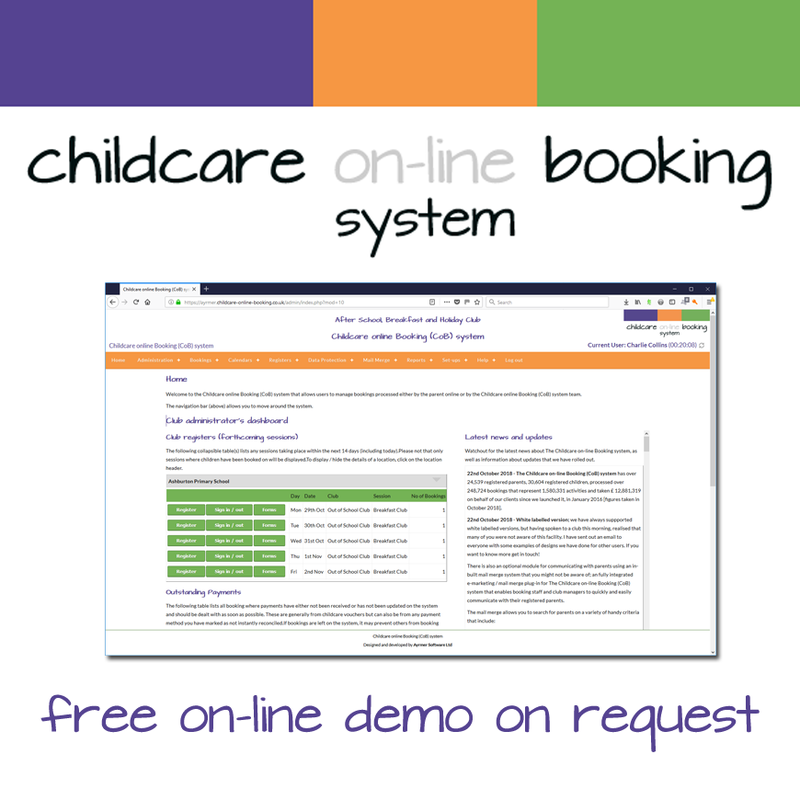 The Childcare on-line Booking (CoB) system is designed to make your wrap-around childcare booking administration, child's play and is so flexible, it can work for virtually any type of setting or school, no matter how complex or bespoke your set-up is, CoB can save you time and money! your club administration & compliance on auto pilot! CoB is proven to reduce the administrative burden for your childcare setting by over 80% [figures based on customer satisfaction survey November 2018] and helps you with Office for Standards in Education, Children's Services and Skills (OFSTED), Early Years Foundation Stage (EYFS) compliance, Safeguarding and General Data Protection Regulation (GDPR), to name four key areas that you have to tackle. Get rid of the endless administrative headache and take control of your childcare setting with a booking system that enforces your terms and conditions, whilst been flexible enough to cater for the real world! In short, is your administration distracting you from getting on and doing what you are passionate about, providing fantastic childcare? Are you struggling to manage your after school club and breakfast club booking, constantly having to make last minute changes to your club registers? How would you like electronic sign-in / sign-out sheets that automatically generate late pick up fees and comply with OFSTED requirements of record keeping? Do you have parents unexpectedly drop their children off at clubs and they haven't got the money to pay for the session? Once again CoB has that covered with drop-in attendance, enabling you to add children to a register and create childcare charges automatically. Are you constantly chasing outstanding payments? CoB streamlines the entire booking process and collects childcare fees at the point of booking [dependent on how you set-up it up, as their are dozens of different approaches] and helps manage late debtors. You can restrict which payment types parents can use - childcare vouchers, credit & debit card, on account, tax-free childcare and many more and even suspend an account for persistent late payers. Francis Saunders (Business Manager), Breakspear School. How would you like your parents to be responsible for booking their children onto clubs and paying at the time of booking from the comfort of their home, whilst at work or out and about? CoB is fully responsive, which means parents and carers can access it via a Personal Computer (PC), Tablet or smart phone and is compatible with Apple, Android, Windows and many more, as it uses HTML5/CSS3 rather than an app that is device dependent. CoB handles children's registration forms, enabling parents to manage their children's information, emergency contacts and authorised collectors, as well as consent (required under GDPR). We care about data and have undertaken CyberEssentialsPlus and IASME to prove that we have taken the appropriate measures to safeguard your data and to date are the only dedicated childcare booking system to boast these essential certificates to help yu comply with GDPR (and any future data protection regulations, following Brexit). We've created a short video that shows how parents register with your childcare setting and can make their first booking in minutes. Create your own breakfast, after school and holiday clubs that matches the way you run your clubs. Prevent over subscription to busy clubs by setting capacities that can be customised down to each day to help manage human resources. Manage charges for clubs using standard or discounted rates to ensure parents are charged the correct amount for their bookings. Set-up booking cut off dates and times to ensure your register is up to date an accurate, but still have the flexibility to add late bookings. Determine if and when parents can cancel club bookings, to prevent parent's block booking holiday clubs and then cancelling bookings at the last minute. After all you want support parents that value your fantastic childcare! Take payment via credit & debit cards and childcare vouchers or create custom payment methods to cater for the way you collect childcare fees and improve cash flow. Stay in touch with parents via e-newsletters and keep parents informed about your club! Ensure parents juggling work / life balance have an easy way to manage their childcare, no matter where they are! With over 300 configurable options, CoB can cater for virtually any scenario and if we still cannot meet your needs, we can provide a custom / bespoke solution for you too! We delighted to have teamed up with The Out of School Alliance and are offering some great discounts for their members and we're passionate about delivering a solution that works for after school and holiday clubs and schools alike. This is our 'baby' and we just want to be able to reach a wider audience, so more clubs and schools can get the benefit! If you would like to know more complete our on-line form or drop us a call on +44 (0) 1364 582017 and we would be delighted to have a chat with you and can set-up a demonstration account, so that you can have a play with it.